I made this purple beanie for a newborn back in March, and yesterday managed to find some time to make a flower appliqué for it. I think it's just what it needed to be extra cute! 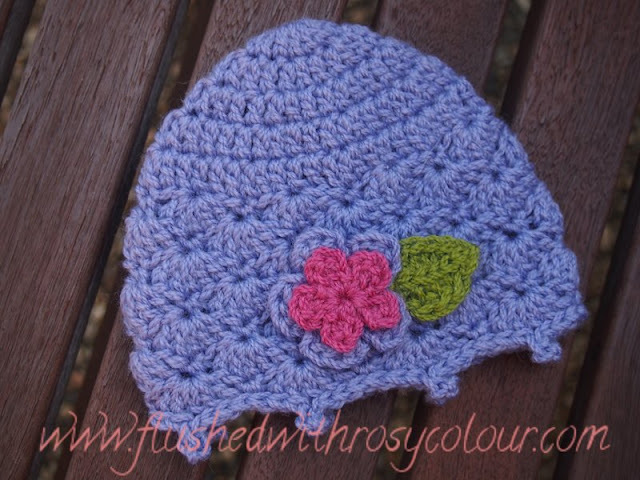 For this beanie and flower I used classic wool from the Bendigo Woollen Mill. Now I've started using just luxury wool for beanies because its softer and not much more expensive. But I had a little of this left so I could do the flower and leaf. I haven't crochet a leaf before, so now was the time to try it. The crochet leaf I liked the most was at a blog called Easy Makes Me Happy. I rather like how it turned out. Go to that blog if you want to see the tutorial on how to make it. For the smallest pink flower I started with a magic circle, (ch 2, dc, ch 2 sl st) into the magic circle 5 times, fasten off. For the larger purple flower I also started with a magic circle, (ch 3, 2 trbl, ch 3, sl st) into magic circle 5 times, fasten off. This newborn sized beanie is homeless, I will try and sell it in my new shop! I'm seriously considering buying a newborn sized doll to model it!